Father, Papa, Daddy — whatever you call the man who helped raise you or is the father of your children, it’s always a wonderful gesture to tell him how much you love him. We must not forget to thank them for their hard work and perseverance as the head of the household. 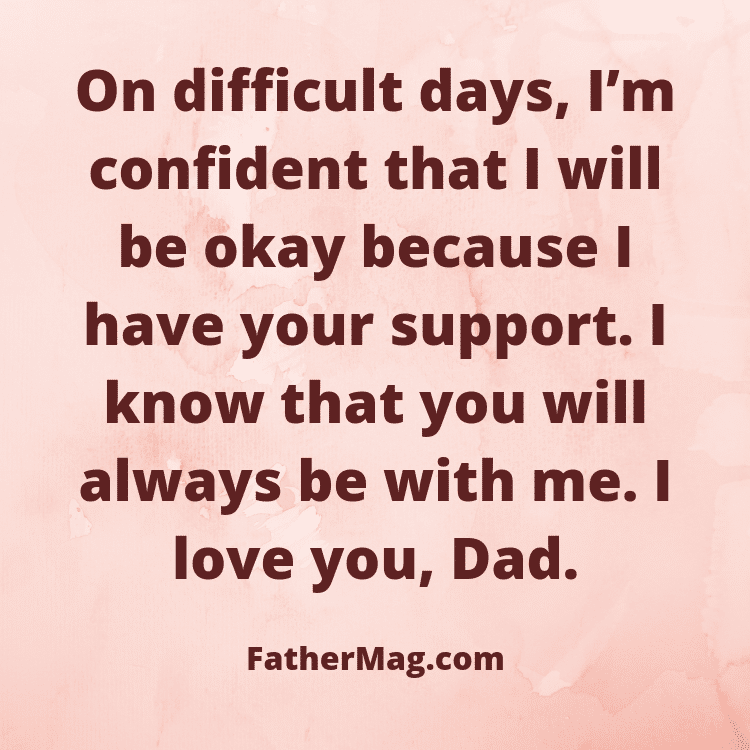 If you need help in finding the right words to tell your father how much you love him, these long list of dad quotes we prepared for you will definitely touch his heart. You only have one dad so make sure you enjoy every moment with him and always let him know how much he means to you! 1. Dad, My all the pleasures are with you; your smile is enough to make my day better. I love you for always being there for me. 2. Dad, Your love is everything for me, and you encourage me in every situation. You hug me even if I do something wrong, You smile at me even if I lie to you, You are always there for me no matter what happens. I love you, daddy. 3. I do not know that what type of love it is that you have for us, love that makes you hug me when I am sad. I love you, dad. 4. I Love You, Daddy. You are like a magnet for me who has attracted me towards the right and repelled me from what is wrong. 5. You are the best dad in the world. You got me everything that i ever thought about, you gave me everything when I was nothing. I wish to return all those by achieving all the goals that you want me to achieve. I love you, dad. 6. I will try hard to become the best child in this world because you are the best dad in this world and you do not deserve less than it. I love you, dad. 7. Being your son is awesome, but the worst part is that following your footsteps is more difficult than anything else. I love you. 8. Daddy. Sometimes I don’t talk to you, sometimes I get annoyed, sometimes I don’t hug. Regardless of what I do in mood swings, I always love you from the core of my heart. I love you. 9. Whenever there is some problem in my life, whenever I feel moody, whenever I am sad. I think of you, and that solves my all problems and make me happy. I love you. 10. You are truly my superhero in plain clothes. I can’t recall the number of times you bailed me out of sticky situations. I don’t know what I’ll do without you. I love you so much, Dad. 11. This thought makes me stronger than my Dad is my support and he is always there for me. I love you, dad. 12. I need a time machine to get back into my childhood to enjoy all the memories all over again that I shared with you. Dad, I love you. 14. You know me very well, and you are familiar with all my bad habits but still, you keep on loving me. Dad, I love you. 15. According to me, you are doing the hardest job of being an awesome dad which involves dealing with the world’s toughest clients, that are a teenage daughter and a teenage son. Daddy, we love you. 16. I do not resist everything I like because I have everything that I need to spend my life in a good way. I love you, dad. 17. The success of the man can be measured by the love he gets from his children, I promise that you will be the most successful in this world. I love you so much, daddy. 18. We both have the same kind of dreams. You dream to make me the happiest daughter/son in this world, and I dream to make you the happiest father in this world. You are the perfect dad. I love you. 19. I am your little girl and biggest fan. I love you, daddy. 20. Daddy, my love for will never fade away, my love for you is a mixture of friendship, care, respect, and family ties. I want to thank you for all the things you have done for me. You are the best dad in this world, and I wish that you live a long life. I love you, daddy. 21. I want to do all the things that give you pleasure, and I want to achieve all the goals that you want me to. I love you, dad, more than anything else in this whole universe. 22. You are the most precious gem in my life and without you, I can not achieve any goal in my life. I love you, dad. 23. If the list of amazing and best people in the world is made, I am sure that your name will be on the top on that list. I love you, dad. 24. Daddy, I want to thank you for trusting my abilities and making me do my best. You are my inspiration. I love You. 25. You held my hand when I was not sure about my choices. You helped me in taking every decision. You are the best dad in the world. I love you. 26. I started loving you when I got to know about the things, and I will keep loving you forever. I love you, daddy. 27. You are the best person in my life. I love you, dad. 28. Besides being the best dad, you are also a best friend, the best teacher and the best person in the world. You are simply the best daddy. I love you. 29. Dad, even a fleeting memory of your loving smile is enough to light up my darkest days. I love you. 30. My life is like a comic book because whenever I am in trouble, I am always saved by a hero called, super dad. I love you. 31. You hug me even when I am wrong, you pat me on the back even when I fail. You smile at me even when I lie, you forgive me even when I curse. If there is anything in life that keeps me going, it’s you, dad. 32. I may detest your advice, abhor your suggestions and loathe your opinions. But that doesn’t stop me from loving the man behind them all. Dad, I love you. 33. On difficult days, I’m confident that I will be okay because I have your support. I know that you will always be with me. I love you, Dad. 34. Dad, I will never find out how you manage to love me despite all the pain I have given you. Sometimes I feel that my brutal lies and hurtful curses don’t deserve the selfless love of an affectionate dad like you. I love you, dad. 35. I will never understand the kind of love you have for me… the kind that makes you want to give me a hug while I am giving you my mood swings. I love you, dad. 36. A man who can single-handedly raise his children, pay the mortgage and make an honest buck is a hero in my books any day. I love you, dad. 37. My daddy is a magnet who has pulled me away from the worst and close to the best of what life has to offer. I love you. 38. Every girl dreams about living the life of a princess. I have never dreamed of that because I have always been treated like a princess by you. I love you, daddy. 39. If I was given a chance to start all over again, there are a lot of things I’d change about my life except one thing, my dad, who’s been there for me through it all. I love you. 40. You brought me every single toy that I wanted when I was young. I hope I can return the favor when I grow up by achieving every single goal that you always wanted me to. I love you. 41. I want to be the most amazing child in the world because the most amazing father in the world deserves nothing less than that. I love you. 42. My love for you is like a freeway during peak hour. It is plagued by the traffic of my teeny tantrums and stops lights of my moody outburst. But at the end of the day, it leads straight to just one destination, your heart. I love you, daddy. 43. I am going to write a letter to Facebook to put a hug button on your profile so I can hug you anytime I want. I love you, daddy. 44. All these years, I have always done what I wanted to, without thinking about its impact on you. Yet, you never did anything without thinking of its impact on me. Thanks for everything, dad. 45. The worst part of being your son is that following your footsteps is going to be more difficult than climbing the highest mountain. I love you. 46. Dad, sometimes I don’t say Hi, sometimes I don’t give you hugs. Sometimes I ignore you, sometimes I get annoyed at you. Regardless of my moody sometimes, I want you to know that deep down inside I love you, all of the time. 47. When friends walk away, when life seems to come to a halt and when the world seems like the cruelest and heartless place. I think of you and everything seems perfect all over again. I love you, dad. 48. There may be a thousand ways to say I love you to a father. But for me, there is just one way to love you, unconditionally. I love you, dad. 49. Nothing makes me feel stronger than knowing that I have a dad who’s got my back. I love you. 50. I love my dad, although I’m definitely critical of him sometimes, like when his pants are too tight. But I love him so much and I try to be really supportive of him. 51. Real men are not those who kill all the bad guys and save the world in movies. Real men are those who strive to be great fathers to their children to make the world a better place, just like you. I love you, dad. 52. I love you for everything that you are, daddy. You are perfect in every way. Thank you for never giving up on me and your annoying grandkids. 53. Superman is not a fictional character found only in comic books and movies. He is my dad who I love to bits. 54. You have seen me at my worst, yet you think that I am the best. I love you, dad. 55. You have the most difficult job in the world called “best dad”. It involves dealing with the toughest customers and clients in the world called “teenage son” and “teenage daughter”. We love you, daddy. 56. I expect a lot from all my friends because my dad has set high standards of friendship, by being my best friend since childhood. I love you. 57. How do I describe my daddy? I just add the three letters EST after cool, strong and best. I love you, dad. 58. If all daddies of the world were like you, the future of all children would be easily predictable, perfect. I love you, dad. 59. Every time I whine for not having something I want, I see your picture to realize that I actually have everything I could ever ask for. I love you, dad. 60. Every dad can treat his daughter like a princess, but very few like you can teach their daughters how to take on the world like a queen. I love you. 61. If a man’s success is measured by how much his children love him, you are the most successful man ever. Daddy, we love you. 62. My dream is to make you the happiest dad in the world while your dream is to make me the happiest daughter in the world. How perfect. I love you, dad. 63. Daddy, your hugs are the shelter that protects me from all the storms life could possibly push me into. I love you. 64. I may be daddy’s little girl, but I am also his biggest fan. I love you. 65. Starting today, I want to do everything that I possibly can to let you know that I love you more than anything else in this world. I love you, old man. 66. Dad, my love for you is a mix of friendship, respect, and family ties. Thanks for everything. 67. Some people don’t believe in heroes, but they haven’t met my dad. I love him so dearly. 68. There may be a lot of amazing people in the world. But the best and the most amazing of them all is you, daddy. I love you. 69. You gave me the best gift anyone could give another person: you were the best father of my dreams. Now I want to be the daughter of your dreams! It will be my present for you. I love you. 70. Not all men can become a good father. I`m lucky to have the best father in the world. I love you. 71. You`re not only a dad: you`re my friend, my boss, and my mentor. I`m happy to have such a unique father. I love you. 72. No one is able to give so much care and warmth as I got from you, daddy. Now it’s my turn to take care of you. I love you so much. 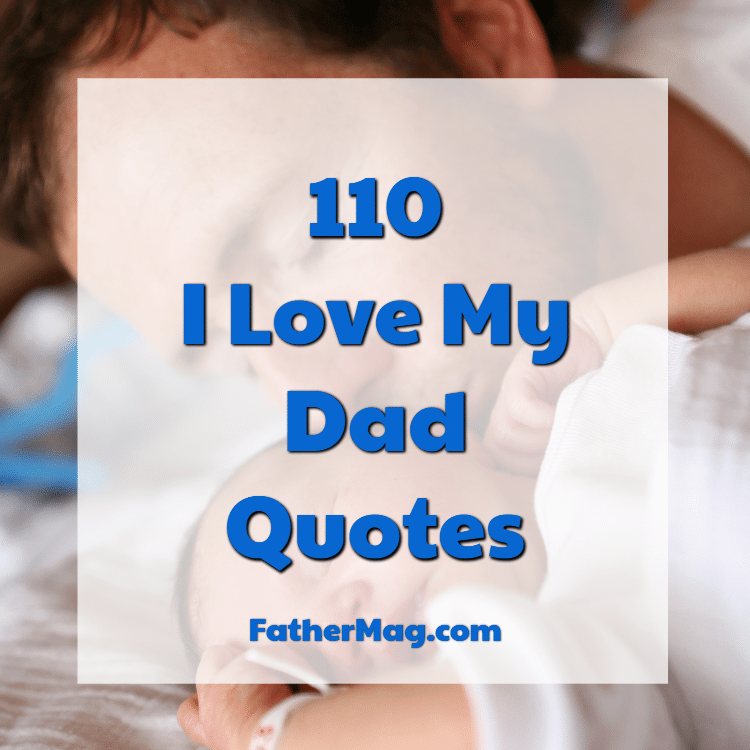 You may also enjoy: 140 Funny Dad Quotes. 73. Have you ever wanted to have a son? You got even a better present! It’s me! 74. Dear daddy, you taught me everything I know. I’m grateful to God for being your daughter. I love you, dad. 75. Daddy, you have to know a secret, you`re the best man in my life, and I will always love you. 76. I`m proud to say, that I`m daddy`s girl! Thank you for being an exceptional father. I love you, daddy. 77. There are hundreds of ways say that I Love You but when I will say only four words. I Love You Unconditionally Dad. Thank You for everything you have done for me. 78. To me, you are the best father in the world. You know how to make me laugh. You know how to make me smile and make me feel confident about myself. Thank you for loving me, Dad, I love you. 79. It’s a dream of every girl to be treated like a princess. You make that dream come true for me, Dad. Every time I’m with you, I feel like royalty. I love you so much, Dad. 80. My friends binge on ice cream and chocolate when they feel down and out. I just pick up the phone and call my dad. I love you. 81. I will grow up, gain weight, fall in love, have kids. But my love for you will never change. My love for you will remain. I love you, Dad. 82. No matter how old my daddy becomes, he will always be the first man who held me up in his arms and cuddled me as if I was the queen of the world. I love you, daddy. 83. You never stopped showing how much you love me in both small and big ways. I never once doubted you love me because every single day, you made sure that I felt it. I love you, Dad. 84. I wanted to do something special for your birthday, but I know how much you hate being the center of attention. You have always been happy standing on the sidelines and supporting us in our endeavors. I love you, dearest Dad. 85. All that I’m working so hard for right now is all for you. I want to make you proud and repay you for all the sacrifices that you made raising me. I love you, Dad. I’m so proud of you. 86. So many times, I hurt or disappointed you, but you never gave up on me. You gave me so many chances. This time I promise to make you proud, Dad, I love you. 87. There are times when I just completely shut off and don’t share anything about my life with you. It doesn’t mean that I don’t care or love you. I love you, Dad, even if I don’t show it often. Read also: 100 Missing Dad Quotes. 88. I’m not scared about the future, because I know that I have you with me every step of the way. You make me feel invincible like I can achieve anything I set my heart on. I love you, Dad. Thank you for everything. 89. I have the best memories growing up because of you, Dad. You made sure that I had the most normal and fun childhood. I am the person that I am now because of your love. I love you, Dad. 90. You are and always will be my first and greatest love, Dad. I owe my life to you. I love you always. 91. To the best father in the world, I want to thank you for all that you sacrificed just so I can enjoy this great life. I wouldn’t trade you for anyone else, Dad. I love you. 92. Some people travel to feel happy. Others go out and party. Me? I just call my Dad. I love you, Dad. 93. If only all children can have a dad as wonderful as you, we will have a world full of happy adults. Thank you for being such a wonderful dad to me. I love you. 94. No matter how busy you are with work, you always make time for us. I know that it’s not easy, but you still make it possible. That makes you a superhero in my eyes. I love you, dad. 95. Dad, I’m sorry if I don’t say this more often. I love you. I have and will always will. I breathe because you breathe. I am happy because you are happy. Thank you for being the best dad anyone could ask for. 96. A hug from you feels like shelter from the storm. Thank you for always coming to my rescue when I need you. I love you, my dearest Dad. 97. I will always be your little girl, Dad. No matter how old I get or how much I change, I will always love you. 98. We may have our differences of opinion, but the love will always be the same. I love you, Dad. 99. I do the things I do because of you, Dad. I want to make you proud. I want to repay you for all the things that you have sacrificed for me. I love you, Dad. Thank you for everything. 100. You are my driving force, Dad. You inspire me to be a better person. I hope that I make you proud. I love you. 101. You were there for me when I was not sure about my decisions. You guided me, and you were so patient with me. You are the best dad in the world. 102. You are the best man in my life, Dad. I will make sure that my future husband is as kind, loving, hardworking, and brilliant as you. I love you. 103. I know that I haven’t been around as often, and we don’t get to talk as much. Don’t worry, Dad. All that’s about to change now. I love you, and I miss you. 104. Boyfriends and husbands will come and go, but dads will always love you no matter what. Thank you for being such a wonderful dad. I love you. 105. If it weren’t for you, I would not be here. I owe my life to you, literally and figuratively speaking. I love you, Dad. 106. Just one conversation with you and I feel 100% better. You always give such good advice. Thank you for always being here. I love you, Dad. 107. Dad, I want to invent the time machine so I can rewind to my childhood and hit pause, to relive all the awesome memories I share with you. I love you. 108. You stood in front of me to protect me when I was vulnerable. You stood behind me to catch me when I fell. You stood by my side to support me when I was alone. Thanks for standing by me all the time. I love you, dad. 109. If I had to live my life all over again, I will still choose to be your daughter. You simply are the best father in the world! I love you with all my heart, Dad. 110. I owe much of my success to you, dad. Without your loving support and guidance, I would not have reached this level of success that I am enjoying now. Thank you for everything, Dad, I love you.